Yellowstone National Park is a fantastic place to visit. The park itself is magical and all the wildlife you see roaming free makes it all the more special plus there’s some great camping in Yellowstone! One problem with visiting, though, is the park is so big, it’s hard to see everything in just a few days. Top that with the limited hotel availability in the park, you end up driving quite a ways from one of the nearby towns and missing out on time exploring the park. One way around that is to camp right in the park. There are plenty of options to choose from when camping in Yellowstone. There are 12 campgrounds in the park and out of those 12, you can make reservations at 5 of them. The rest are first-come, first-serve. The campgrounds that allow reservations are Bridge Bay, Canyon, Fishing Bridge RV Park, Grant Village and Madison. For the RV’ers reading this, pretty much all of these campgrounds allow RV’s, but only Fishing Bridge has hook ups. For more information on these reservable campgrounds, check out this: Yellowstone camping guide. Here you’ll find details on what each campground offers as well as approximate cost. We really like the east end of the park near Yellowstone Lake. Fishing Bridge, Bridge Bay and Grant are both really close to the lake. This part of the park is much less busy than the west end near Old Faithful, while beautiful scenic views of the the lake with mountain ranges in the background. To make reservations at any of these parks or to find more details on the campsites, visit http://www.yellowstonenationalparklodges.com/. If you’re in Yellowstone and have a bit more flexibility, the first-come, first-serve campgrounds are a great option. Some of these are a bit more rustic and out in the wild, but can offer some great views, stars and wildlife watching. The first-come, first-serve campgrounds include Indian Creek, Lewis Lake, Mammoth, Norris, Pebble Creek, Slough Creek, Tower Fall. These campgrounds are also a bit more limiting on the size of RV’s allowed. Most of them are 30′ or less, so make sure to pay attention to that if you’re looking to stay at one of these campgrounds. Since Yellowstone campgrounds usually book up almost a year in advance, it’s nice to know there are some options of extending your stay if you are able to. Check the table on Yellowstone’s site (https://www.nps.gov/yell/planyourvisit/campgrounds.htm) to see whether the campground is open or not and when it was filled up on the current and previous day. This will give you an idea of when you have to be in line to get your spot for the night. Also check that site for rules on particular campgrounds. For instance, Fishing Bridge is a hard-sided only camping facility, meaning no tents or pop up trailers. The reason is it has high bear activity. There are also requirements on food storage to keep you and the animals safe in the park. Hopefully this has been helpful in sharing the options for camping in Yellowstone. To get off the beaten path, definitely check out our 10 Unique Adventures Guide In Yellowstone! 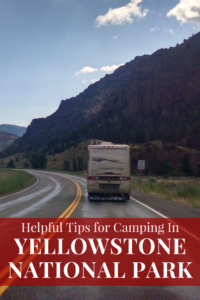 Be the first to comment on "Helpful Tips For Camping in Yellowstone National Park"